"GEO is a clear case of a group that does much with very little." Read more about "GEO is a clear case of a group that does much with very little." "GEO is an important conduit for on-the-ground news from the cooperative world"
Read more about "GEO is an important conduit for on-the-ground news from the cooperative world"
Read more about "I...depend on GEO to keep me connected to this wild and inspiring movement!" Read more about "GEO has progressed to become the nation's leading forum for discussion and debate regarding worker cooperatives and...grassroots economic organizing." "GEO is one of the most important projects active today." Read more about "GEO is one of the most important projects active today." This theme of Grassroots Economic Organizing celebrates the positive legacies and accomplishments of cooperative development in the past and lights the path to further growing the southern cooperative movement. The Austin Cooperative Summit brought together more than 100 people interested in cooperative businesses to help move the Central Texas economy toward shared abundance and prosperity. The summit is a program of the Austin Cooperative Business Association and NCBA CLUSA. 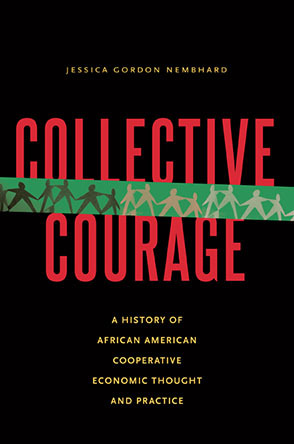 [Editors note: Collective Courage can be purchased online from PSU Press here. Use the code JGN14 at checkout to recieve a 20% discount. Please encourage your local libraries and co-ops to purchase a copy of this important resource. In 1920, Black people owned and farmed over 15 million acres in the South; by 1960, this had declined to 100,000 Black farmers owning less than 6 million acres; by 1980, there were only 57,000 Blacks owning less than 4 million acres; the 2007 Agricultural Census, said there are less than 25,000 Black farm families remaining with a little less than 3 million acres.